Ho, ho, ho, it's not Christmas yet, but it's about time we start preparing ourselves and our phones for what is one of the most wonderful holidays of the year. If you still haven't gotten in the Christmas mood, now's probably the perfect time to do so, and we know just what you need! 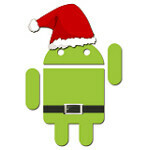 An awesome collection of Christmas apps for your Android phone to cheer you up and make you want to make good stuff happen. And we can certainly make it happen, folks, we just need to open our hearts and forget about the troubles and meaningless arguments of everyday life, at least for a little while. Are you ready to put a smile on that face? Let's go then! If you've been so lost in your daily grind that you've actually forgotten the true meaning of Christmas, this interactive storybook will quickly help you to refresh your memories. Christmas gift shopping made easy! This simple but fun application will let you easily organize stuff you have to buy, while keeping track of all the people and the costs of their presents. Christmas is not Christmas without Christmas carols, that much is certain. So why don't you get this app and start warming up your vocal chords for a fine performance after Christmas dinner. "I MUST find some way to stop Christmas from coming!" So what did the Grinch think of? Why, to steal all the presents, of course! That should do it, right? Wrong! Get this digital book to enjoy a professional narration of this amazing story. This official app of the NORAD Tracks Santa program will let you track Santa's flight on December 24, as well as play the fun "Thin Ice" mini-game. Well, we guess a list of Android apps, be them Christmas ones, will never be full if we don't have an Angry Birds game. Thankfully, there's Angry Birds Seasons once again - the constantly evolving Angry Birds game that will now treat you to some merry Christmas season visuals. Having a Christmas-themed live wallpaper is probably the best way to get in the Christmas spirit. Here's a wonderful and tweakable one. Now, here's something really cool - a pack of Christmas ringtones! With these, the smile will always be back on your face each time someone calls. Combining more than 50 Christmas radio stations, this app will be streaming the best Christmas music to you non-stop. Some examples of stations include Xmas in Frisko, Jazz Radio Christmas, Christmas Lounge, Kristmas Kountry, as well as North Pole Radio. And finally, here's another game that will keep your mind working during those rare idle moments of the Christmas season. Design and decorate your own Christmas-themed restaurant in Restaurant Story: Christmas! Hey Wendy, That's actually a great bargain because it's $300 plus taxt in the App Store. I believe it's called a joke. List left me wanting more, Like the Christmas HD wallpaper. Instead of #2 I have been using All I Want From Santa, it came with my Nook that I got over Black Friday. Love it. Wishlists and Letter to Santa in one. Happy Holidays! Nice list...but check out this great holiday app for kids - Elf Finder 2013: Search and Track Hidden Elves. It’ll get your kids in the Christmas spirit as they run around searching for Santa’s elves - knowing that the elves will be watching to see if they’re being naughty or nice.